Katie Lou Samuelson would always follow her older sisters - Bonnie and Karlie - to their youth basketball practices near their Huntington Beach, California, home. But even from her young age the baby of the family would follow her own path. She’d find her love of basketball in middle school, and the passion continues to this day. Her journey has taken her 3,000 miles from home and 3,000 miles from where her older sisters went to college. And at the University of Connecticut and with the Huskies she follows her own path. Unbeaten UConn is the overall No. 1 seed for the NCAA Tournament and the top seed for the Albany (New York) Regional. The Huskies begin their bid for a 12th national championship Saturday against Saint Francis of Pennsylvania at Gampel Pavilion. While she finds a way to stand out walking around campus, it’s what she’s done at Gampel and in arenas around the country that have set her apart. The 6-foot-3 guard enters the NCAA Tournament averaging 17.9 points on 53.1 percent shooting from the floor, 4.4 rebounds, and 3.7 assists. No one knew when she got serious about the game that she would become the most-decorated player in her family. But it didn’t take long to figure out she had potential. “I was good at it and I liked that part,” Samuelson said. “I liked that I was better than other people. That might not be the greatest thing to say. I wanted to get better. So every time she took the court with her older sisters she would be challenged. When she was in eighth grade, Bonnie Samuelson was on her way to being a McDonald’s All-American and had a scholarship to Stanford, while Karlie was an emerging star alongside Bonnie at Edison High and was drawing interest from colleges around the country, including from UConn. Karlie and Katie Lou would play the 2011-12 season together at Edison High before the sisters transferred to powerhouse Mater Dei in Santa Ana, California. 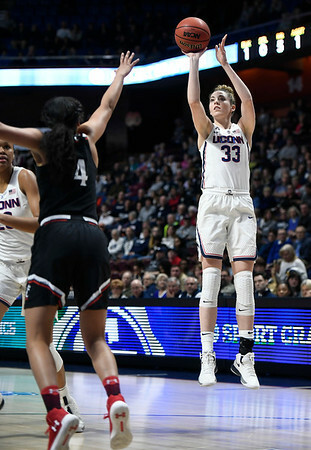 At the end of her junior year, Karlie announced she would join her older sister at Stanford, choosing the Cardinal over the Huskies in spite of a strong bid from UConn coaches Geno Auriemma and Chris Dailey. It was widely thought Katie Lou would make it a Stanford Samuelson trifecta. But she would follow her own path. "They recruited Bonnie a bit and Karlie a bit more,” she said. “That’s when I looked up Coach Auriemma and everything UConn. She made an unofficial visit to Storrs during January of her junior year when Mater Dei was playing in the HoopHall Classic in Springfield and returned in April for her official visit. She also visited Stanford. After returning from Palo Alto, she announced her decision. As a freshman at UConn she would play a complementary role to All-Americans Breanna Stewart, Moriah Jefferson, and Morgan Tuck. The first part of the season was a struggle but once she emerged as a starter there would be no stopping her. She was named to the all-freshman team and the all-tournament team of the American Athletic Conference. Her season would end prematurely when she broke her left foot on the first possession of the national semifinal against Oregon State - she still managed to play through the injury the entire first half - and she missed the final versus Syracuse that capped off UConn’s unprecedented fourth consecutive national championship. With the Big Three gone, she knew she would have to raise her game as a sophomore. If she didn’t know, Auriemma gave her a harsh reminder at halftime of the opener at Florida State. The hurt on Samuelson's face showed. She would go on to have one of the best sophomore years in UConn history alongside classmate Napheesa Collier. She would share the AAC Player of the Year award with Collier and be the Most Outstanding Player of the league tournament after torching South Florida for 40 points in the final. But the bid for another NCAA title ended with a loss to Mississippi State in the national semifinals. As a junior she has been even better, even though she has played through left foot and left ankle injuries that have cost her five games. She gives credit to Auriemma and his staff. “You hear him all the time, ‘I’m a California kid that’s sometimes too relaxed and lazy,’ ” Samuelson said. “But it’s been really good. I feel like I can push his buttons back now. When I was a freshman I would have never considered it. I was terrified. We have a good relationship and I understand how he has helped me get to a place where I didn’t think I could and I’m grateful for that. Last week she was named to the AAC all-tournament team for the third straight year. Only 12 Huskies have been selected to an all-tournament team in all four of her years. More individual honors will come her way as March rolls along. But what her team does the next three weeks will determine whether she’ll considered her season a success or not. The Huskies are six victories from the national championship with the trophy being awarded on April 1 in Columbus, Ohio. The path starts at Gampel Pavilion on Saturday. Posted in New Britain Herald, UConn on Wednesday, 14 March 2018 20:25. Updated: Wednesday, 14 March 2018 20:28.